Day 1 of the Perini Navi Cup was marked by light air and a calm sea state. An impressive fleet of 16 private yachts and charter yachts built by Perini Navi enjoyed clear skies and a challenging day, utilising the training of the previous days to full effect. A well deserved victory on the first day of racing went to luxury charter yacht Rosehearty. Perini Navi has selected the ORC Super Yacht Rule for the 2015 Perini Navi Cup, whereby the appropriate time-on-distance rating allowance determines the starting time for each yacht. Put simply, the slowest rated yacht starts first and the fastest last – first to the finish is the winner. 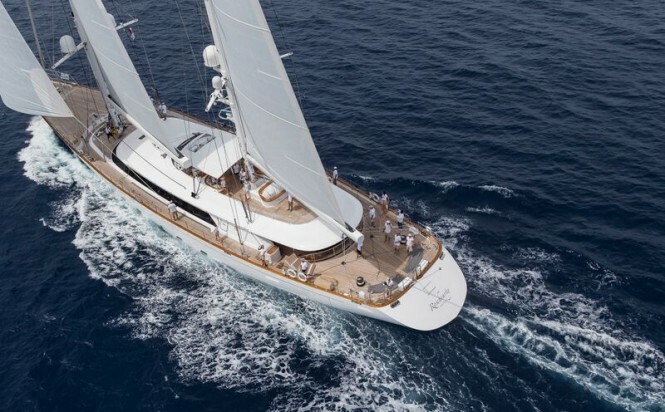 The first vessel to cross the line was luxury charter yacht Maltese Falcon, being 19 minutes ahead of superyacht Jasali II, which led the following yachts in a quicker succession of staggered starts. The last vessel to cross the line was luxury yacht Perseus^3, an hour after the starting 88-metre mega yacht Maltese Falcon, highlighting the difference in performance of each vessel in the race. The first leg saw the fleet beat upwind to Monaci. With Paul Cayard on the helm, charter yacht Rosehearty made a tactical decision to tack in-shore where more consistent breeze enabled her to obtain the first mark in the lead, overtaking Maltese Falcon and Jasali II in the process. Approaching the first mark, super yacht Clan VIII took the inside line around the 1200-ton superyacht Maltese Falcon finding herself taking 2nd place. The thrilling racing continued on leg two as Clan VIII sailed into the wind shadow of Caprera in calming North-Westerly breezes. 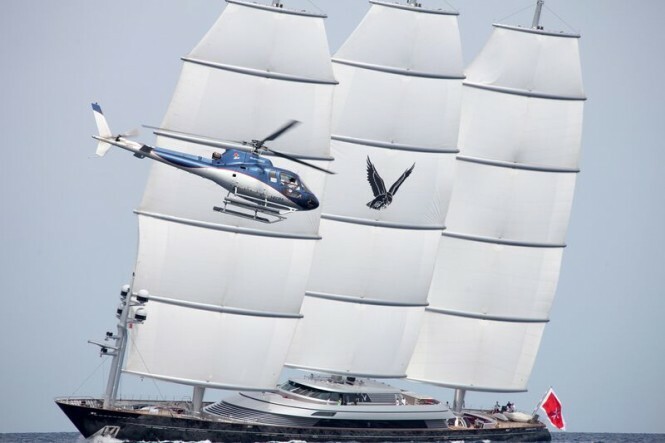 The Maltese Falcon capitalized and used their momentum to roll over the top of Clan VIII and take second place back. 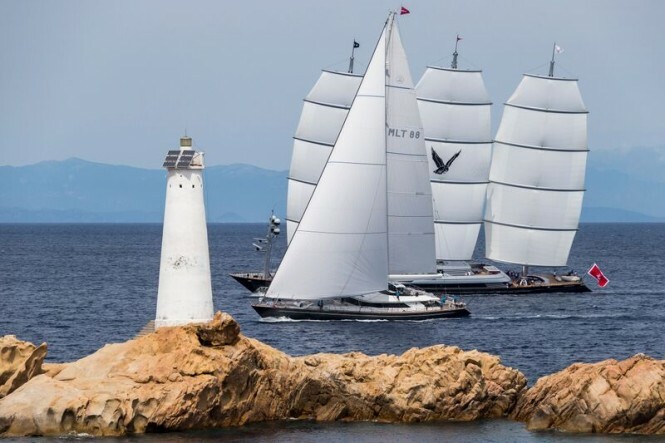 As the wind continued to drop, charter yacht Seahawk, Perseus^3, sailing yacht Elettra and Jasali II yacht were becalmed out of the running as The Maltese Falcon placed third, Clan VIII second and Rosehearty secured a well-deserved victory with a corrected time of almost 50 minutes above her ranking pursuers. Light airs had forced the Race Committee to shorten the course. Rosehearty took line honours and victory on corrected time by a very impressive 48 minutes. As Rosehearty crossed the finish, Perseus^3 had barely reached the first mark due to the handicapped start. Perseus showed her performance pedigree on leg 2, utilizing her 76m rig in the light airs to overtake Jasali II and Elettra whilst also catching up with rival Seahawk. 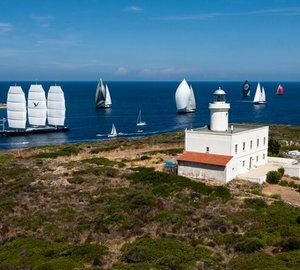 Please contact CharterWorld - the luxury yacht charter specialist - for more on superyacht news item "Well deserved victory for luxury charter yacht ROSEHEARTY on Day 1 of Perini Navi Cup 2015".